Prices for most major commodity groups continued to increase in November over the previous month, with energy prices leading the pack. Commodity prices rose an aggregated 1.0% month-on-month in November, the fifth consecutive monthly increase, according to an estimate by FocusEconomics. The increase in commodity prices in November reflected the extension of the OPEC oil cut deal, the effects of stricter environmental regulations in China and sustained strength in global PMIs, particularly in China. Moreover, mounting geopolitical tensions in the Middle East also contributed to the recent surge in energy prices. In this month’s survey, analysts polled by FocusEconomics expect commodities prices to increase 13.2% in Q4 2017 from the same period last year, which would represent an acceleration over the 12.2% expansion registered in Q4 2016. Looking forward, forecasters see more volatility in commodity prices, which will be dragged down by energy and base metal prices. 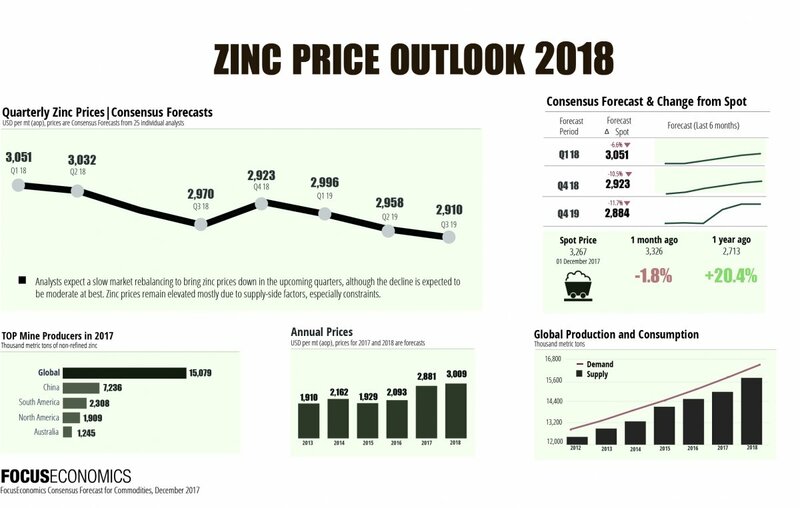 The Consensus view among commodities experts is that lingering uncertainties over the state of the Chinese economy and increased supply will lead overall commodity prices to decline 2.0% in annual terms in Q4 2018. Agriculture prices continued to slowly gain traction, expanding at the fastest pace in over one year in November (+2.2% month-on-month). Although variations in agriculture commodity prices largely depend on developments in each market, the rebound in October and November likely reflected the impact of higher energy prices, since agriculture is energy intensive. Wool prices continued to trade at record highs due to soaring demand from China and Europe, while supply remains tight. Going forward, our panel of analysts considers that the outlook for agricultural commodities remains positive. They forecast a 5.7% annual increase in Q4 2018, from a projected 3.3% year-on-year rise in Q4 2017. Next year, sugar prices should recover from this year’s dismal performance as more producers switch to producing ethanol. Lower production for corn in key countries such as Brazil and China will likely also boost prices. Despite a potential surplus, coffee and cocoa prices should benefit from resilient demand. Prices for base metals increased a mild 0.3% over the previous month in November, recording the sixth consecutive monthly increase. China’s decision to curb steel output from November 2017 to March 2018 to reduce pollution has increased the price for steel and the cost of input materials such as copper, iron ore and nickel. Increasing expectations of strong demand for electric batteries sent nickel prices to levels last seen over two years ago at the start of November. The commodity, however, failed to consolidate these gains and slid in the following weeks amid reduced demand from alloy makers and weak economic data from China for October. Likewise, other base metals such as zinc felt the pinch of the soft data in China and rising inventories. The high trend for base metal prices is set to come to an end in 2018 following two years of sizeable gains on the back of stronger-than-expected demand in China and resilient growth in developed economies. The reversal in base metal prices will stem from a moderate economic slowdown in China, particularly in commodity-intense sectors. Fixed-asset investments in the world’s second-largest economy are slowing, and the real estate sector is gradually cooling. That said, the economic cycle outside China will be supportive of base metal activities. Against this backdrop, analysts see base metal prices falling 3.7% in Q4 2018 from the same quarter in 2017. Energy prices continued to rally in November on the back of the expected extension of the OPEC oil cut deal and strong demand for key commodities. Energy prices expanded 7.2% month-on-month in November, marking the largest increase so far this year. On 30 November, OPEC members and Russia decided to extend the oil output cut of 1.8 million barrels per day (mbpd) by an additional nine months to the end of 2018. Although the announcement was largely expected by market participants, statements by Russia calling into question the extension had initially cast some doubts about the success of the deal. With this agreement, the supply of oil will remain tight next year, paving the way for the oil market to rebalance following years of deficit. Furthermore, U.S. natural gas prices increased in November, buttressed by higher demand for heating as the winter season approaches in the Northern Hemisphere. Although the market remains oversupplied, uranium prices increased in November due to the closure of some mines to revive a commodity that entered a bear market when Japan closed its nuclear reactors in the wake of the Fukushima disaster in 2011. Despite the current sweet spot in the energy market, there are reasons to remain skeptical about future developments. While higher oil prices will allow shale companies to ramp up production, participants in the oil deal will be tempted to deviate from quotas to improve their battered finances, potentially limiting any upswing in crude prices. Moreover, increased supplies of coking and thermal coal, coupled with reduced demand from China, will cloud the outlook for coal. As a result, analysts surveyed by FocusEconomics expect energy commodities prices to decline 3.0% year-on-year in Q4 2018. Prices for precious metals increased slightly in November (0.4% month-on-month), rebounding from a steep 2.5% fall in October. Palladium led the increase in November due to strong demand as consumers are switching to gasoline-powered vehicles amid globally strong car sales, notably in China and the European Union. Gold and silver prices were broadly unchanged in November as a strong stream of U.S. economic data and upbeat sentiment around U.S. tax cuts reduced investors’ appetite for safe-haven assets. The Federal Reserve’s tightening cycle and positive prospects for the U.S. economy should limit gains in the gold and silver markets. That said, gold and silver prices will be highly determined by the level of geopolitical risks. In this regard, tensions in the Korean peninsula and next year’s election cycle in key countries, including Brazil, Egypt and Italy could boost political unrest, thereby pushing demand up for safe-haven assets. While demand for palladium, this year’s best performer among precious metals, should remain strong next year, increased supply could put a cap on price gains. As a result, analysts polled for this month’s survey see base metal prices for Q4 2018 unchanged from the same quarter in 2017.